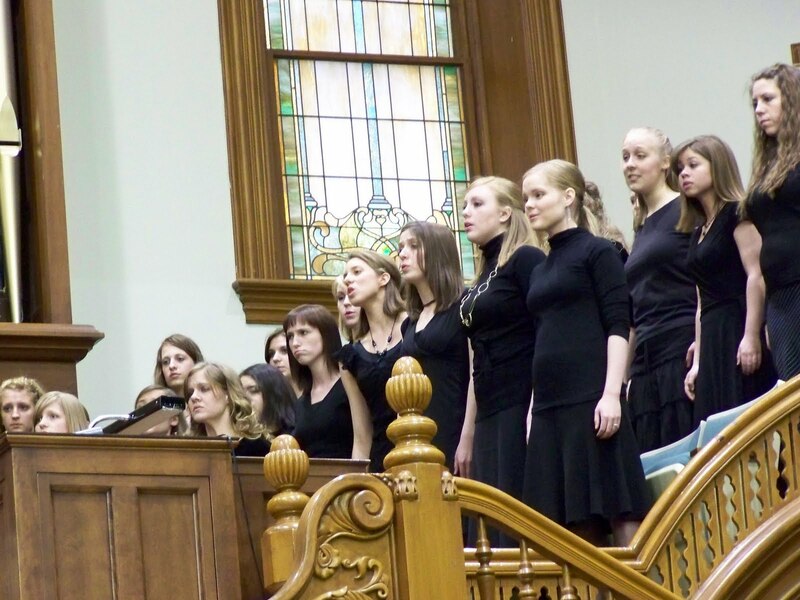 University Chorale performance at the Provo Tabernacle, April 2008. Do you see me? I love music. And I love to make music. To me, very few experiences enrich the soul like being part of a musical ensemble. During high school, I was very involved in my school's choral program and loved (almost) every second of it. My favorite part by far was performing. Get me up on a stage with a huge choir of accomplished singers and I am a happy girl. Some of my best memories include performing with the Arizona All-State Choirs throughout high school. I was on top of the world back then. While at BYU, I decided to minor in music. I sang with the University Chorale for four semesters and I just ate it up. See, in college, you don't have whiny, drama-laden teenagers to deal with. Everyone puts their whole heart into the music and the performances. There were some truly magical moments in those rehearsals. Moments that gave me chills and brought me to tears. I know, that sounded so music-geek, didn't it? But I am what I am. I AM A MUSIC GEEK! Since then, I haven't done much with my vocal talent. I do sing with my church's choir, which is wholly uplifting and enjoyable. But other than that, I can't classify myself as much more than a shower/car/kitchen singer. And it's time to change that. Out here, we have what's call the East Valley Mormon Choral Organization. It's a group of ensembles (choirs and orchestras) that rehearse weekly and perform a few times a year. The adult choir and orchestra are audition-only, so they are obviously high-caliber ensembles. I've wanted to be in the EVCMO choir ever since I moved back to Arizona, but between my internship, pregnancy and nursing, I just knew it wouldn't work out. Another time, another season. A few people in my church congregation happen to be members of the choir. Last month at choir practice, one of them told me I needed to audition. Coincidentally (or maybe not), this incident took place only a few days after I had weaned Smush. I'm not pregnant and I don't have a nursing baby, I thought. I have no excuses. It's time. But I put it off even still. I'm embarrassed to admit it, but the only thing holding me back was the fear of getting into something that was too hard to commit to, and then having to give up. I hate giving up. I can't admit defeat. It kills me. Tonight, faith conquered fear. I finally took the plunge. With Eric Whitacre's virtual choir as my soundtrack, I filled out an audition request form and sent it in. I'm doing this and I'm not looking back! Here's your challenge: Find one thing you really want to do but are afraid to do and do it (or start doing it) anyway. Some examples: Propose to your girlfriend. Sign up for a class. Hike the Superstitions. Run in a race. Host a dinner party. Talk to someone you really want to get to know better. Audition for a play or musical group. Sing karaoke. Ad-match something at Wal-Mart. Potty train your kid. Go skydiving. Go no-poo! It doesn't have to be big; the only criteria are it has to be something you're scared of doing and it has to be something you WANT to do it. And like last time, you have ONE WEEK to complete the challenge. wow i was totally thinking this the other day...whats stopping me from doing exactly what i want to do...NOTHING! so i started a new blog! check it out! i'm just a newbie but i'm hoping to get more interest soon! i thought maybe a giveaway would help! haha. btw you are beautiful! and i would love for you to guest on my blog sometime! Awesome! I love to sing too, I hope you make it! that's so exciting! since i've heard your voice, i happen to know it's beyond amazing. good for you for using your talent. Oh my goodness, Jenna. You will LOVE evmco. Brandon Stewart is one of those amazingly talented people who brings out the best in everyone. I LOVE being in the orchestra and can't wait to be rotated back in (took this semester off for baby). Good luck! I have focused on my writing and in one day 2 opportunities came to me! It's been awesome. I was the only person holding me back and now here I am feeling successful! Jenna, I have been thinking for days about what I want to do. It finally came to me, I really want to start a service club. Something that women I know can get together and do once a month. I used to do weekly service but with kids and work it got in the way. I am going to get something going this week and I will check in. As for last week's challenge, Jay and I made postcards and mailed them to special people to us. It was nice to reconnect and show appreciation for those we love and care about.